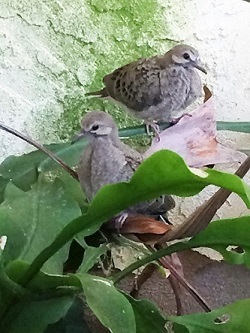 Two years ago a pair of doves made a nest in the hanging plant just outside my front door. They had two eggs, they were hatched, and flown the coop. They had a second set of eggs and these hatched as well. The father stayed with them during the day and the mom at night, that was until the night the mom didn't show up. Me being the worry wart that I am, crocheted a small square patch and placed it over the hatchlings so they wouldn't get cold in the night. The next morning I came out and looked and there was the hatchlings the crocheted square and the father. He came back for three days, after that and on the third day, when I was sitting outside, he came up and stopped right in front of me and looked at me with his one eye, (they don't look straight at you) and told me this would be the last time he would come, and it was up to me to watch over his babies. He spent the rest of the day with them and never came back. The next day I got on the internet and answered all of my questions about how to take care of baby doves. 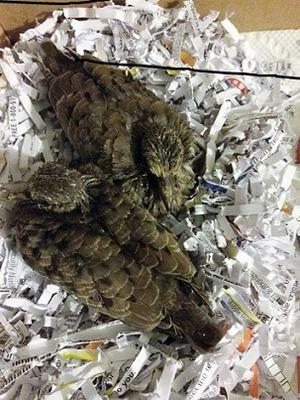 I got a shoe box filled it with shredded paper and put the hatchlings in it. Went to the local feed store and purchased some squab feed and fed the hatchlings every 4 hours daily for about a week. I then increased their water and thickened their food until they would no longer take it. 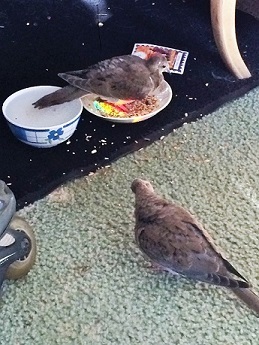 I had dove feed in one dish and water in another. This continued for another week or until they started spreading their wings to fly. I was afraid they wouldn't be accepted by all the other doves and not be allowed to play in any dove games. But that didn't matter because Edwin & Myrtle, did I tell you their names yet? Well Edwin & Myrtle had a four bedroom house with a dog for their nest. To make a long story short, here it is 2 years later and Edwin is still coming to see me, he has had 3 sets of babies all born in the same spot he was born in. He comes in my house and will get as close to me as he can without touching me, he won't let me touch him but he can touch me anytime he wants. He absolutely loves my dog, a 130 lb white German Shepard, He often snuggles up with him. Myrtle comes around but she is completely wild and has forgotten me or what I did for her. Edwin comes into my house and even spends the night if he chooses to, he has a perch in my bedroom and he just flies in there and beds down for the night. I have to be in there he doesn't like being alone. He has even gone so far as to scold me for staying up to late. He really is a character you have to see it to believe it. I've not seen Edwin for sure for a couple weeks now at least it was the last time he walked/flew into my front room. 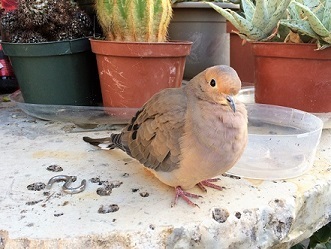 I have a feeder outside my front door and it is filled with doves daily there is a dove who doesn't fly away when I walk out the front door I am assuming it is Edwin the only way I know for sure is when he comes in the house outside the doves act just like all the other ones. I can say he and Myrtle did have at least 2 sets of babies maybe even 3 this season and most of the doves hanging around are all part of Edwin and Myrtle's brood from the last 5 years. I do post allot of pictures on Instagram of Edwin and Oden (my dog) I'm sure he's okay he disappears and reappears all the time. I've learned to not worry he's a wild bird and whatever happens happens it's nature, there's nothing I can do about it. I take pleasure knowing I've extended his life and knowing he knows he has a place he can come to and be safe and secure. I love those little birds and they bring me pleasure daily. Hi there! I know it’s been a long time, but would you happen to have any info for an update on Edwin? I hope he made it and is living the good life. What a wonderful story. Thank you for sharing. Those Doves are so lucky to have you in their lives. keep us all posted, will you! Today was the day! Edwin went outside and flew away, be safe little buddy! Edwin stayed for approximately 4 1/2 weeks, he was ready to leave and already flying a week ago, just needed to be sure he was ready. He's been cooing for the last 3 weeks, guess he had to make mating season, horny little devil. I hope he stays safe and away from whatever got him. I found another dead dove in my back yard the other day, the whole body this time. I hope it wasn't Myrtle. I will continue to feed the birds, this time I'm feeding them out in the open instead of under the tree, so they can see what's coming at them. It's all part of nature and the cycle of life I know, but if my little guy could live a nice long life I would be ever so grateful and pleased. To anyone who might find a hurt bird please don't be afraid to help it out, it is so much more rewarding than you can imagine. Hopefully my little guy will be back to eat and drink in the morning, who knows he might be back tonight after all my home is his nest. Since posting the last story Edwin and Myrtle have continued to come and go Myrtle is as wild as ever but she still comes here to eat along with about 50 other doves. This has been going on fine until about a month ago. Now its turned into death row with the hawks finding new hunting grounds. There have been 4 birds that I know of that have been killed. When all the birds come to eat every morning the way I know Edwin from the others is he comes to my door the others keep their distance and he isn't afraid of my dog, when all the birds fly away Edwin just sits there. One morning about 3 weeks ago I turned around and there was Edwin, he was very roughed up. I did not see him fly in and I didn't see him fly away. The next morning he was there again and I saw the extent of the damage, he had 1 tail feather and half of the feathers on one wing left he was not able to fly. He stayed on the inside of my front porch on top of the window until it got dark by then he had moved to the hanging plant he was born in. I walked up to him and put my finger out he jumped on but not before getting in a few pecks to my hand, they don't hurt. I brought him into the house to his old perch where he stayed the night. Next morning he went out to the same spot spent the day out there so I thought. I had to go to work, when I returned Edwin was no where to be found until I saw him stick his head out from behind my staghorn plant that is behind my door. I put my finger out he immediately jumped on brought him in the house where he stayed the day and night. I forgot to tell you that while Edwin was out in the morning he witnessed a hawk swoop in and grab a bird leaving nothing but feathers and blood behind. I think that hawk tried to get him again and that's why he was hiding. For the next week almost two weeks he had no desire to go outside. Yesterday and today he has gone outside to eat but he doesn't leave my side. When I move he moves. then he runs back into the house and goes to his favorite spot and sits there until nighttime then he just walks back to my room and gets on his perch. His feathers are coming back in slowly but surely and he can flutter across the room so he should be back to normal before to long and then we'll see what happens if he's ready to face this wild world we live in. I'm so happy he came home to mend. That was a beautiful Story Pati, May God Bless You. Sweet, and just an amazing lil. story. I have a momma, and her babies out side my front door in a bush. Mom, and Dad were both dedicated to the two eggs, until three days after they were born. Then coming not so often. Leaving them almost all day, but she had her eye on her babies from a far! They came out of the Nest this morning, and I panicked.! Would love to see pictures or a video... What a wonderful story. I hope the nest on my balcony makes it. You are the best dove Mama!! The photos are so adorable. Pati you are something else, what a great story. I love that Edwin still comes home to hang out with you and your shepard dog, keep doing what you do!